Made of #304 Stainless steel,the thick gauge stainless steel,definitely not cheap made,a proper weight to work with. Pure stainless steel without annoying rubber,certainly serve you for years. Brushed finish external makes it a high-ending appearance,also avoid fingerprints. leave sitting out on the counter and bar.NOT as shallow as normal bowls. For all occasions:everyday use, restaurant use, promotion use or taking out for dipping at picnics; perfect for "mise en place" bowls,UNBREAKABLE ! Heat resistant,perfect for Hot Food or Baby Feeding,stainless steel bowl wouldn't be broken and safe for kids and children using.Enjoy the cooking fun with families. Please trust us that your purchasing of our products is with no risk and we do 30 days money back guarantee.Any problems,pls feel free to contact us by email and we will solve them asap. and you can check our Brand and store"Meluoher",unique service you will receive. 1)DO NOT cut food on stainless steel product. Sharp objects may scratch it. 2)Oil stains can be removed easily by wet sponge or cloth with cold water after having been soaked into hot water for a little while. 3)When not in use, clean thoroughly and store it in a dry environment. UNBREAKABLE AND MEET DAILY NEEDS:Great for serving Soup and Rice,like container for vegetables, fruits, ramen, pasta,candy, etc. 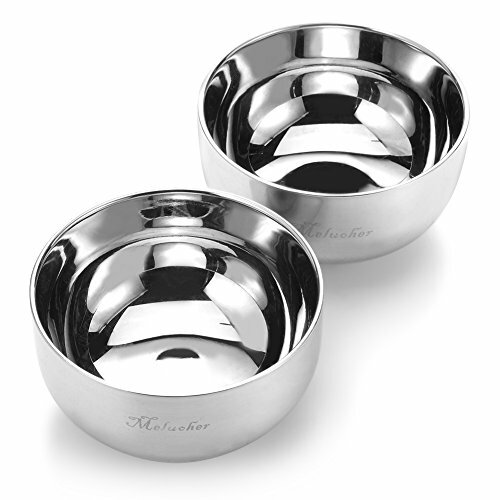 HEAT INSULTED AND EASY CARE:Dual Layer Steel designed for INSULTAION.Dishwasher safe. MATERIAL:Premium SUS304 hand polished stainless steel finish,FDA approved,solid and sturdy,would NOT bend or warp even you press it in a very hard way. GUANRANTEED:30 days refund or replacement guarantee. If you have any questions about this product by Meluoher, contact us by completing and submitting the form below. If you are looking for a specif part number, please include it with your message.